Me, I’m great. Have been forgoing the joy of blogging about food and am starting to realize the error in my ways. I eat amazing vegetarian food every single day here in India. One of my ‘justifications’ is that millions of others do too, and there are about a bajillion Indian vegetarian food blogs out there to satiate the masses. But this is mine, and if for no other reason, I realize that a personal record of my eatings and cookings is in order if for none other than myself. And you, my dear reader. The rest of my time is spent with friends, new and old. Cooking, eating & drinking. Shopping. Exploring. Visiting nature spots around the city and enjoying the sounds of silence. Which is the best antidote to a city like Mumbai, I have to say. I have bought a couple of cookbooks, and I go to peoples houses and help cook food. I take pictures and jot down recipes. I basically do everything a good food blogger is supposed to do except for the most important thing: blog. So there is a backlog of posts for me to catch up on. But then I think…there are a million recipes for this already on the web so why bother? And then I remember that no two things are the same. And that if I post something I just might turn one or two people onto something awesome that they otherwise might not ever learn. Enough of my self-justifying rambling. Enter poha. This is another Indian convenience food, normally enjoyed for breakfast. Mumbaikers eat this all the time. For all you cats outside of India, you’ll have to take a trip to an Indian market and buy poha, which is precooked, flattened and dry rice. It is a flaky cereal that can easily be reconstituted with a sprinkling of water. It is then seasoned and lightly cooked with a few simple ingredients to create this delicious and quick meal. Left: dry poha. Right: moistened poha. While you are at the Indian market, go ahead and pick up a couple of other awesome staples. 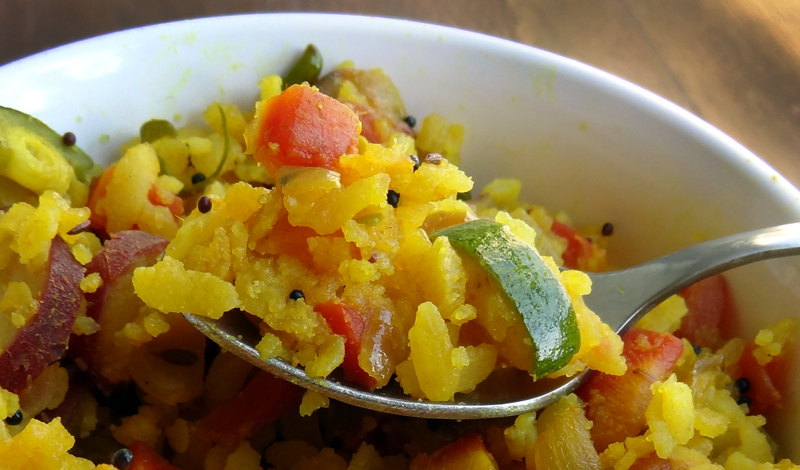 For poha you want curry leaves, mustard seed, turmeric, cumin seeds, mustard oil, coconut oil, and green chillis. And while you are there, just because they are delicious (but not necessary for this recipe) grab some jaggery, black salt, papad, dosa batter, and a block of paneer. I have been experimenting with all sorts of different oils here, and have landed on a hands-down favorite. I love to cook in a blend of coconut oil and mustard oil. The coconut oil has a lovely flavor, very high smoking point and smooth finish. Mustard oil lends a sharp bite and color to the mix. The combination of these two oils, especially when tempered with mustard and cumin seeds results in a frothy, rich and downright yummy base in which to cook your food. It is ambrosia. best flavors in the kitchen: onion, garlic, ginger and hot peppers. Back to poha. I have eaten it multiple times here. Then, I asked people how they made it. Finally, I looked at some recipes on the web. Then I went ahead with my own version. This is what I am offering you now. I call it poha deluxe because I, in true veggie voyager style, always add lots of extra veggies to my recipes. Enjoy! Chopped veggies of your choice. I used 1 large carrot, 1 small sweet potato, 1 tomato, and some small green vegetables whose name evades me. You can use anything you like: zucchini, cauliflower, potato, mushroom, bell peppers, etc. Place the poha in a strainer. Pour distilled water over it to wash and moisten it. Allow to sit for 5 minutes until it is puffy. Sprinkle more water on if necessary. Do not overstir or overmoisten, as you want to keep the shape of the poha. Set aside. In a skillet over medium-high, heat the mustard and coconut oil. When hot, add the mustard seeds and allow to crackle for a few seconds. Add the cumin seed and sputter for a few more seconds. When the ambrosia smell comes up, add the curry leaves, onion and then the garlic, and ginger. When this is translucent and golden, add the rest of the spices and the chopped veggies. Reduce heat and sauté until the veggies are tender. I like to add the tomatoes in last to retain their fresh, juicy nature. Now add the moistened, puffed up poha. cook a couple minutes longer, gently stirring to mix while not destroying the poha. If it is too dry seeming, sprinkle a SMALL amount of water and gently mix. Salt to taste. 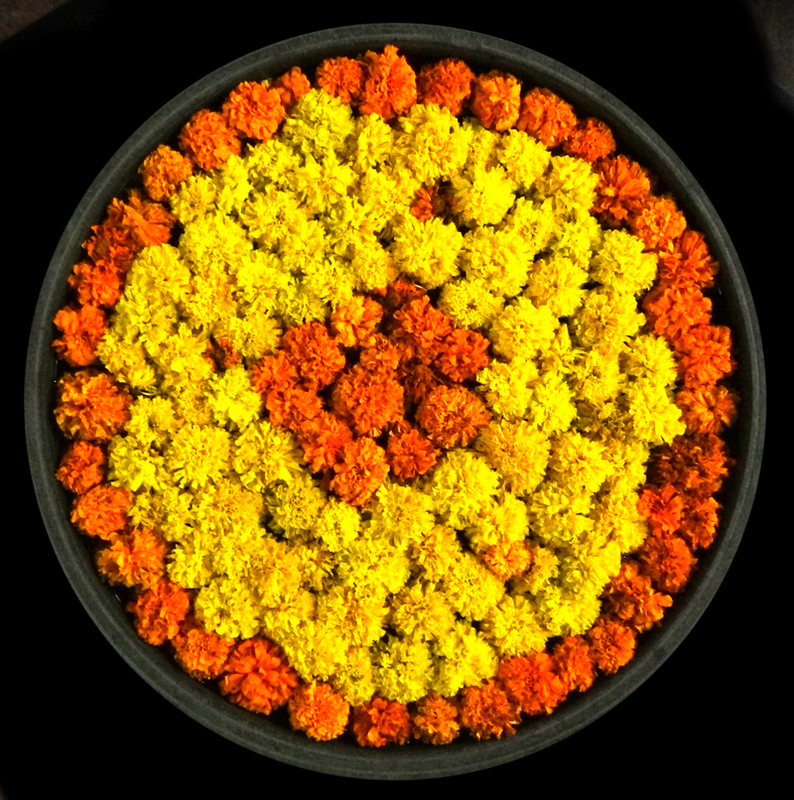 The poha should be golden yellow, speckled with mustard seed and vegetables. 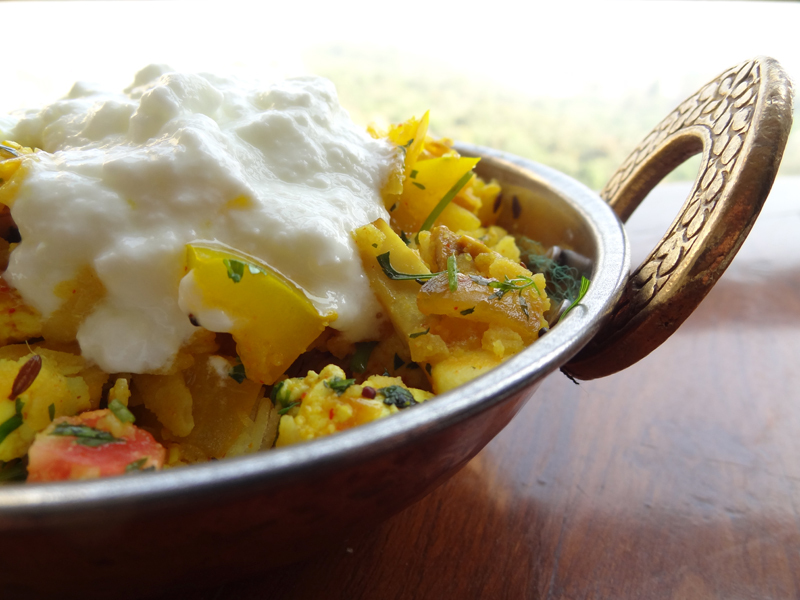 To serve: garnish with a small handful of chopped cilantro and a dollop of fresh yogurt. I want to try this Doha Deluxe! I'm sure my dad wil enjoy this recipe. Is it okay though if I add more turmeric/curcumin powder? Nice read and insights! Snack seasonings make a world of a difference when it comes to recipes & I am excited to give this one my best shot.